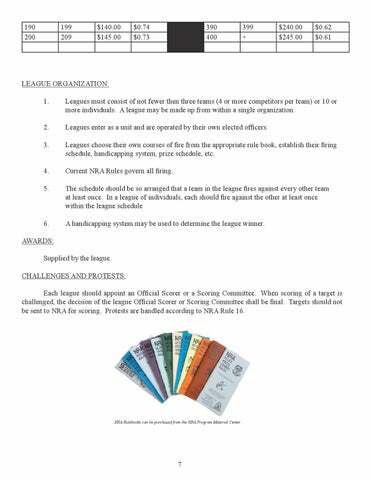 Leagues must consist of not fewer then three teams (4 or more competitors per team) or 10 or more individuals. A league may be made up from within a single organization. Leagues enter as a unit and are operated by their own elected officers. Leagues choose their own courses of fire from the appropriate rule book, establish their firing schedule, handicapping system, prize schedule, etc. Current NRA Rules govern all firing. A handicapping system may be used to determine the league winner. AWARDS: Supplied by the league. CHALLENGES AND PROTESTS: Each league should appoint an Official Scorer or a Scoring Committee. When scoring of a target is challenged, the decision of the league Official Scorer or Scoring Committee shall be final. Targets should not be sent to NRA for scoring. Protests are handled according to NRA Rule 16.